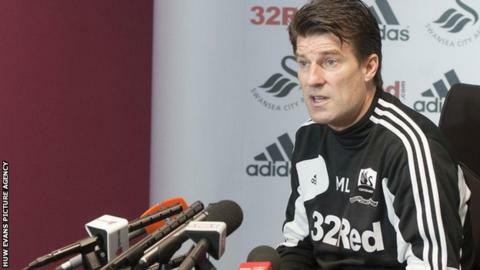 Swansea City manager Michael Laudrup wants life bans for anyone found guilty of match-fixing. He was commenting on claims by European police that 680 games across the world have been fixed, including one Champions League game in England. "If someone gets caught being paid to lose a game, they should be banned for life," said the Dane. "This sport is about winning, if you receive money to lose a game you should be banned." The allegation of widespread corruption in football has come from Europol, which began an inquiry into match-fixing 18 months ago. As well as 680 fixtures, some 425 match officials, club officials, players and criminals are suspected of being involved. Laudrup caused a stir in September when he said it was acceptable for teams to accept payment from other clubs to win games. But the former Denmark, Real Madrid and Barcelona play-maker said purposely losing a game was an entirely different scenario. "If you are a player or a manager, if you get paid to lose a game you should be banned forever," he said. "Then players would think about the risk of getting caught, it's quite a risk to take if you are banned for life - not like cycling where you may take something but get banned for a year or two, it should be for life." Fifa, world football's governing body, has said they have the power to ban match-fixers for life from the game, but have called for longer prison sentences for criminals involved. One of the biggest cases of match-fixing was uncovered in Italy in 2006 when Juventus, Fiorentina, Lazio and AC Milan were all implicated. Juventus, where Laudrup played for six years during the 1980s, were relegated from Serie A while Fiorentina, Lazio and AC Milan had points deducted.